In the following topic, you can find a brief introduction to using the Amazon QuickSight user interface. Consult your administrator before changing your AWS Region. Your default AWS Region is configured by your Amazon QuickSight administrator. Changing the AWS Region changes where your work is stored. If you have autodiscovered data sources, your start screen looks like the following screenshot. Optionally, you can dismiss this data source information by choosing the X icon near the top right. 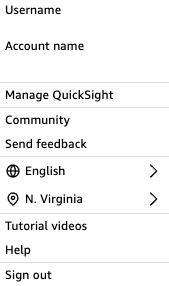 To view videos about Amazon QuickSight, choose the Tutorial videos tab. Choose a video to play it. To access the user profile menu, choose your user icon at the upper right of any page in Amazon QuickSight. Use this menu to manage Amazon QuickSight features, visit the community, send product feedback, choose a language, get help from the documentation, or sign out of Amazon QuickSight. Manage QuickSight – If you have appropriate permissions, you can access administrative functions such as managing users, subscriptions, SPICE capacity, and account settings. Community – Choose this option to visit the Amazon QuickSight online community. Send feedback – This is your direct connection to the product team. Use this simple form to report problems, request features, or tell us how you are using Amazon QuickSight. Language setting – Choose the language you want to use in the Amazon QuickSight user interface. Help – This will open the official AWS documentation, which you can view online, in Kindle, or as a PDF. Sign out – Choose this option to sign out of Amazon QuickSight and your AWS session.